This musical animated film is based on a German classic fairy tale which tells a story of young Rapunzel (voiced by Mandy Moore) whose hair is magical and extremely multi-purposely useful due to its incredible length. 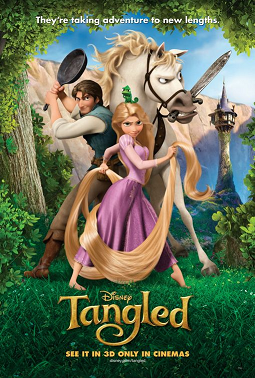 The official title of this film is actually ‘Tangled’ and ‘Rapunzel’ was the original title before its release. Not quite sure why it was still released with the original title here in Malaysia. My only guess is that they were afraid that we’re too unintelligent to figure out that it’s actually the same movie. According to some sources, this could be Disney’s final classic fairy tale-based film. Well I wouldn’t be surprised if it’s true. They are making original and much better animations with Pixar. Though I would love to see them try doing ‘Journey to the West’. Verdict: Disney animated films that are based on a classic fairy tale would never fail to entertain. Although this one’s quite predictable to me, I still find it enjoyable. However with all that being said, this is not going to be one of those memorable Disney classics. The music certainly didn’t impress me. Smart move, or is it? If you read the original version of Rapunzel, the storyline is different. Rapunzel is not supposed to be a princess while the Flynn/Eugene is supposed to be the prince and he turned blind in the story. Well surely, Disney did all these alterations to bring a more positive feel to the film but it seems to me that they’ve gotten little too lazy with the ending. This special screening was courtesy of Churp Churp.